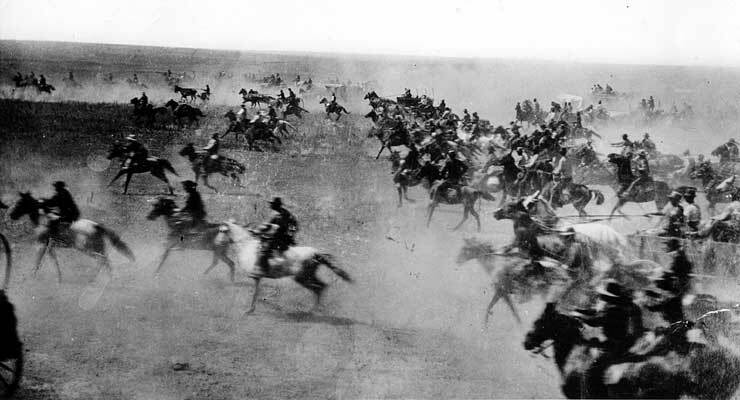 One of the most infamous events during the homesteading period in America is the Oklahoma Land Rush, where thousands of acres of land was open to the public to claim for whoever could get there first. Not long ago, I was doing a lot of researching for the first book of my historical mystery series The Paper Chase Mysteries. 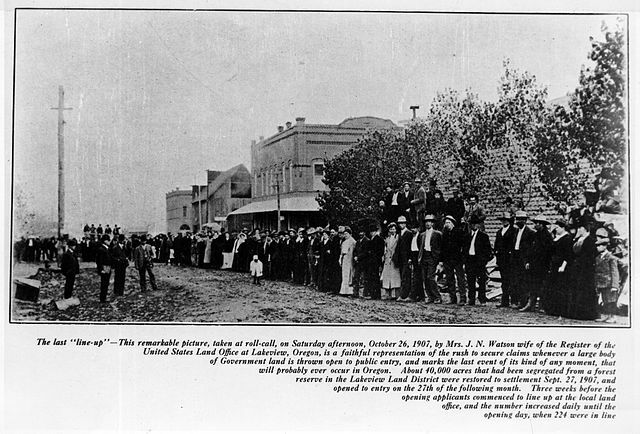 In Book 1 of the series, The Pink Rose Murder, one of my characters is a prominent land owner and I wanted to research a bit more about land ownership in America in the early 20th century. This led me to homesteading in the American West in the 19th century and I thought it interesting to note the presence of women homesteaders in this history that are rarely mentioned. Homesteading is perhaps one of the most prevalent legends of American history. Many films and books romanticize it as a time when the average person could pursue the American dream of owning his or her own land and home. Homesteading brings to mind visions of proud and persevering pioneers rattling through a desert wilderness in covered wagons with their wives and children, eager to tame a wilderness filled with harsh weather, hostile Native American tribes, and uncivilized surroundings. And indeed the ideals of homesteading did begin in this way. The Homestead Act of 1862 had several purposes for the government. It was a way to populate the “wild West” territories that the government had recently acquired so that America could grow and prosper and it was also a way to make the American Dream of land and home ownership more available to the average Joe and Jane. The idea behind it was that anyone over the age of 21 (and this included not only men but also women and people of color) could own up to 160 acres of land in the West provided they lived there for five years and made something more efficient and useful out of it. As with most things in America, money talked, and an alternative to this deal was to purchase the land at $1.25 an acre after six months. Of course, the homesteading dream didn’t quite live up to the ideal. Many people who migrated West didn’t always know what they were letting themselves in for. They had little or no farming experience and thus didn’t always have the skills to deal with the hardships of making the land useful, including harsh weather, wild animals, and wars with neighboring ranchers who used the land for their cattle rather than crops. It wasn’t uncommon for homesteaders to go into debt very quickly and abandon their homes and farms or declare bankruptcy. However, homesteading did offer a shot at independence, not only for immigrant men who would have otherwise slaved away as laborers or factory workers making less than minimum wage and living in squalid tenements in the big cities, but also for those who had previously had no taste of freedom because of prejudice – African Americans and, of course, women. During the first twenty or thirty years after the passing of the Homestead Act, it seemed as if the idea of a woman owning her own land and working it wasn’t unacceptable. This is maybe because the harsh and foreign nature of the West made people throw aside the ideals of the separate spheres so that the “delicacy of woman” proved itself false when women participated in the hard work of farming the land and weathering storms, tornados, and hurricanes. Another well-known story of women homesteaders is the Chrisman sisters. 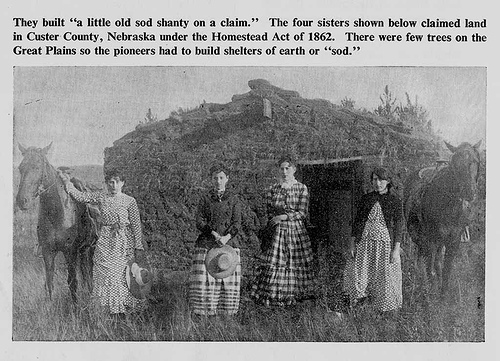 These were four sisters who settled in Nebraska and build a successful homestead. The first recorded woman homesteader was Mary Meier, a German immigrant who came to America with her husband and they homesteaded to Nebraska. Her husband died a few years later, leaving Mary alone to cultivate the land. About a third of the women homesteaders who went West actually did not start out as homesteaders but as wives of homesteading men and widowhood made them landowners and farmers. However, there were still two-thirds of the women homesteaders who came alone, many of them middle-aged and immigrants, their level of maturity and experience in life perhaps making them good candidates for the realities of frontier life sans men. It’s a shame that little is known about these women, although my research shows that more academics are beginning to delve into the history of women in the period of homesteading in America. The resilience of these women and their determination that they too should get a piece of the American dream is something to be admired.